Private Hayes was employed as a Rifleman within 6 Platoon, C (Essex) Company. He was responsible for providing assistance and security to the local population which included conducting patrols to disrupt insurgent activity in one of Helmand province’s most challenging and dangerous areas. Private Hayes was born in Cambridge on 9 May 1990, and grew up there. He completed his training at the Infantry Training Centre Catterick on 2 February 2009, aged 18, and joined the ‘Vikings’ shortly afterwards. Before deploying to Afghanistan, Private Hayes completed a number of demanding exercises in the United Kingdom and convincingly won his weight category during the battalion’s 2009 Inter-Company Boxing Championships. Trying to express the true measure of our sorrow - and our sense of loss - at this time, is impossible. We are still coming to terms with this devastating news. However, we are strengthened by the thought that he was with his comrades, doing the job he so dearly loved, when his life was taken. 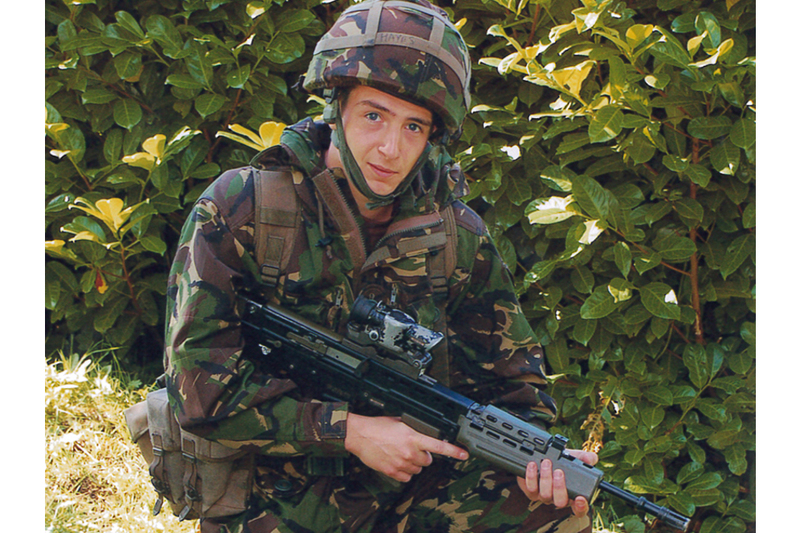 From childhood, Robbie had one ambition, to be a soldier. He fulfilled his dream last February, passing out from training at Catterick where he was described as a man of great determination and a credit to his platoon. Sport, particularly rugby and boxing, became his passion. He was a very popular young player for Newmarket Rugby Club, and won his battalion’s Boxing Championships at welterweight in his first attempt. Robbie loved all aspects of life in his home village, Burwell, in Cambridgeshire. Among his peers he enjoyed great popularity but found particular happiness with his girlfriend, Gemma. After training for Afghanistan he deployed to Helmand province last October. There his potential for promotion became noticeable. Robbie sincerely believed his fellow ‘Vikings’ were his ‘other’, military, family. Although he had an enthusiastic and energetic personality, our son could just as easily behave with the manners of a gentle, reflective, caring person. As a grieving family, we would ask that our privacy be respected. We also ask that our brave son’s memory be duly honoured. I was shocked and saddened to the core to learn of the death of Private Robert Hayes killed today in the Nad e-Ali district. He died whilst on patrol in an area that has seen some of the most intense fighting with the insurgents that seek to undermine the Afghan Government. In the past two months, he and his platoon have given their all to deliver a secure environment for the people of Nad e-Ali in what are some of the most demanding of conditions. Robert’s death leaves a huge hole in the Vikings’ ranks; he will be remembered as a trusted member of the team, a young man whose energy for life was contagious, for his bravery and sense of humour. Robert was a young man who made a real difference in his short time with the battalion - he has been taken from us and we are all the poorer for his passing. I know that all members of the Vikings will join me in offering our thoughts and prayers to Robert’s family and friends. He will be remembered forever more. The tragic loss of such a young, gifted and promising member of C Company is deeply saddening. Although he had only been in the Army for just over a year, Private Robert Hayes was quick to make his own mark and as a result became widely recognised across the battalion as an extremely capable soldier, brave comrade and talented boxer. He fully accepted his role in Afghanistan and ensured that his personal contribution to the mission made a genuine difference. For over two months he was involved in heavy and relentless fighting against insurgents and always acted in a courageous, decisive and selfless manner. The considerate way in which he interacted with the local population was synonymous with someone who was genuinely decent and wanted betterment for those less fortunate than himself. Private Robert Hayes was immensely popular and sacrificed his life doing something that he truly believed in. His loss is widely felt across all ranks within the company and our thoughts at this awful time remain firmly with his family and loved ones at home for whom the pain will be immeasurable. Private Hayes was a stalwart of 6 Platoon. Despite only being in the Army a short time he was a supremely confident soldier and loved being on operations. He had endless energy, a wicked sense of humour and was always involved in any platoon pranks. He was extremely popular with his peers and could often be found laughing and joking with them. Private Hayes was a huge asset to the platoon and he will be sorely missed by all of the Mighty VI [6 Platoon]. No words can explain the utter devastation I feel for his family. My thoughts are with them and I only hope they can draw solace from his passion and belief in the job he was doing. Private Hayes was an essential member of 6 Platoon; he was always motivated and always conducted himself as a professional soldier. He was extremely proactive and never showed any signs of fear when engaged with the enemy. Robert is the type of character you cannot help but like and being in his company was nothing short of a pleasure. Although Robert is no longer with us, he will never leave our minds and will now join his Viking brothers. Our thoughts are with his family at this time of bereavement and our words are not enough when it comes to describing one of our own. Robert Hayes - a Viking, a friend, a brother and a sad loss - rest forever in peace. Private Robert Hayes was one of the funniest blokes I knew. Whenever I saw him he always had a smile on his face. I had only known Rob a short while as he was fairly new in the regiment but he was a massive personality in 6 Platoon. I have never met someone as motivated and brave. He was a great soldier and an even better friend. You will never be forgotten. See you on the other side mate. A true friend has been taken from us and we hope you are in a better place mate. We will never be the same again. Words cannot describe how we feel. You’ll never be forgotten. A true VI. RIP. Private Robert Hayes was one of my closest friends. He always walked around with a smile on his face. I’ll never forget the fun times we have shared together such as boxing training and our week in Newquay. I shall miss him dearly and never forget his smile. I was truly saddened to hear of the death of Private Hayes. A soldier who was regarded by all as full of energy and ability, both when he was soldiering and when boxing and playing rugby - he clearly excelled at both. His loss will be keenly felt by all, but none more so than his family. Our thoughts are with them and his close friends and colleagues.